Geothermal heat pumps are a novel approach to heating and cooling your home, or heating potable water, without using much electricity. They can directly replace old HVAC components, or they can be built into a new site from the beginning. Geothermal is also known as the ground-source heat pump. The soil in the ground is typically much more stable in temperature than the air. It’s almost always warmer than the air in winter and cooler than the air in summer. A geothermal heat pump takes the heat out of a house in summer and exchanges it for cooler air – cooled by ground or groundwater, reversing the process in the winter. Water-source heat pumps work much the same way, except the coils are placed at the bottom of a pond or lake, all year long. The well can also be used. Some parts are subterranean, like the coils, so they are safe from freezing temperatures and potential for damage. You can get some geothermal heat pumps that are hybrids, so if the temperatures in your area have some extremes like very hot summers or very cold winters, you can get a boost for more effective heating and cooling. Basically, in all cases, the heat pump utilizes the heat exchanger that allows extraction or rejection of heat, taken from/to ground or water. The heat exchanger and other components are totally located inside the house, resulting in the elimination of frost problems but higher noise inside the house. Ground-source heat pumps can be installed for almost any size of residential building, and they can go almost anywhere on the property. They consist of a few main components; the heat pump, heat transfer medium, coil and ductwork. An inside unit takes up about the same amount of room as a standard heat pump does. Within the category there are four main subsets – horizontal, vertical, pond (spiral), and open loop. The first three are all closed loop. Your HVAC dealer can help you determine which ones are the best for your needs. 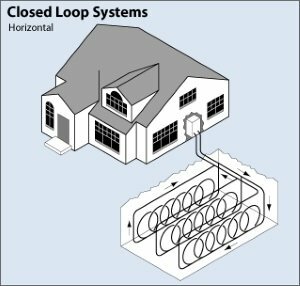 Closed loop systems use antifreeze in a loop of coils that are buried in the ground or kept under water. A heat exchanger then regulates the temperatures. Horizontal systems are buried in four-foot deep trenches where the pipe is looped around. Vertical systems are ideal for bigger buildings where they need to have more heating and cooling power, but the ground area for the loop installation has a limited size. Holes are drilled in regular intervals as much as 400 feet deep where pipes are then set and connected to each other. Pond systems work the same way as a horizontal system, but the spiral loop system is placed in water instead of the ground at a minimum depth of eight feet. An open loop system doesn’t use antifreeze but rather uses water. There are some environmental concerns with this type as it discharges the used water back into the water supply, so permitting is more stringent and local water quality codes have to be met. DX or direct-expansion systems use the refrigerant in the heat exchanger, instead of using the antifreeze solution. These are some of the most energy efficient products available, and they are highly rated by the Department of Energy. They don’t produce pollutants, and they don’t rely on any fossil fuels to operate, so they are environmentally friendly as well. Because they don’t need any external energy source to run except for the pump, they can save you significant amounts of money on your utility bills. They can even serve dual duty and be used for heating water as well, or at least help preheat the tank so the water doesn’t have as far to have to come up to temperature. With fewer moving parts, you can also reduce the amount of maintenance you will have to do. Geothermal heat pumps can last for as long as 25 years, and the coils themselves might last as long as 50 years. They operate quietly, and because they draw heat from the ground, they don’t have a noisy outdoor compressor or fan – only the indoor quiet fan is present. Unlike gas furnaces, there is no open flame to worry about, and no pilot light that could go out. They also work very evenly so you don’t have a cool spot in one part of your house and a hot spot in another. They heat as much as 70% more effectively than other types of HVAC systems and cool as much as 40% more effectively than a regular air conditioner. Geothermal heat pumps are a lot more costly than their mechanical, air source cousins. A large quantity of refrigerant that is used in closed loop setup is expensive. Professional service is required and is costly, even for repairs if the loop gets damaged. Heavy excavation is required for installation and may not be possible on some lots. The supply of geothermal heat pump’s manufacturers, contractors and dealers is limited. Contact your local HVAC dealer for their advice on what will be the best set up for your house and needs. You will need to consider your building size and the cooling or heating needs you have. You will also want to factor in the type of ground you have and whether vertical or horizontal coils make the most sense. Site accessibility and the amount of digging and drilling should also be considered. In the existing homes, a geothermal retrofit is very expensive due to all the modifications that are needed; excavation, ductwork, and other, while in newer homes, these costs are lower. Geothermal heat pumps have only been around for about 70 years, but they can make a lifetime of difference when it comes to heating and cooling your home. Check with your local HVAC dealer for more information and to learn about rebates and financing opportunities in your area. Due to the complexity of work, lack of resources and being relatively new technology, geothermal systems should not be treated as the DIY project.